Jean Piaget was a Swiss psychologist who is known for conducting a systematic study of the acquisition of understanding in children. He is widely considered to be the most important figure in the 20th-century developmental psychology. 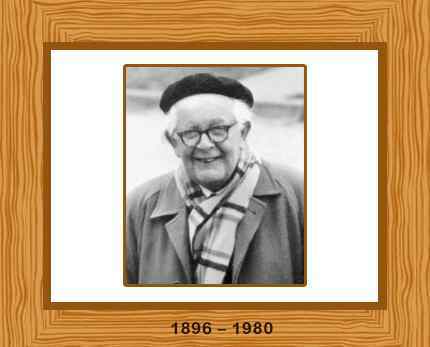 Born on 9 August in 1896 in Neuchâtel, Switzerland, Jean Piaget’s father, Arthur Piaget, taught medieval literature at the University of Neuchâtel. Piaget showed an early interest in biology and the natural world. At high school, he was interested in mollusks and he became a well-known malacologist writing many articles on the subject throughout his life. He attended the University of Neuchâtel studying zoology and philosophy where he obtained his doctorate in 1918, and later, enrolled for a semester at the University of Zürich where he became interested in psychology. Even as a young student, Piaget wrote two philosophical papers that were unfortunately rejected as adolescent thoughts. Piaget worked for a year at a boys’ institution created by Alfred Binet in France where he standardized Burt’s test of intelligence and began his studies on children’s mental development. He became director of studies at the J.J. Rousseau Institute in Geneva in 1921. In 1923, he married Valentine Châtenay and they had three children, Jacqueline, Lucienne and Laurent. From 1925 to 1929 Piaget was professor of psychology, sociology, and the philosophy of science at the University of Neuchâtel. He accepted the position of professor of child psychology at the University of Geneva in 1929, and remained at the university until his death in 1980. Simultaneously he also had a professorship at the University of Lausanne in Switzerland from 1938 to 1951. From 1952 to 1964 he was also professor of Genetic Psychology at the Sorbonne in Paris. It has been believed that no theoretical framework has had a bigger influence on developmental psychology than that of Jean Piaget. He founded the International Centre of Genetic Epistemology at Geneva in 1955 and became its director. He made extraordinary contributions in various areas, including sociology, experimental psychology and scientific thought. Piaget took ideas from biology, psychology and philosophy and investigated the method by which children learn about the world. He based his conclusions about child development on his observations and conversations with his own, as well as other children. By asking them ingenious and revealing questions about simple problems he had devised, he shaped a picture of their way of viewing the world by analyzing their mistaken responses. He formulated an outstandingly well-articulated and integrated theory of cognitive development. Piaget was a highly prolific author who wrote about 70 books and more than 100 articles about human psychology. His theoretical conceptualizations have induced a vast amount of research. Jean Piaget was honored with the Balzan Prize for Social and Political Sciences in 1979. The following year, he died on September 16, 1980. He was 84 years old.